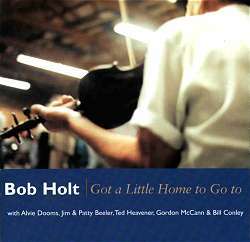 Bob Holt of Ava, in southwestern Missouri, is well-known in midwestern old-time circles as a square-dance fiddler par excellence, with a fast, driving style that reflects influences ranging from other Ozark fiddlers to early old-time recordings, but that has also been molded by years of playing for dancers. (Have a look at Julie Henigan's Bob Holt article for more information about the man). His repertoire is large and inclusive, comprised of seemingly countless breakdowns, waltzes, two-steps, rags, blues, polkas, schottisches, novelty pieces, and anything else that takes his fancy. The vitality and rhythmic excitement and lift of his playing are often commented upon and are what make him such a marvelous dance musician. While Bob has already issued two self-produced cassettes (see below), 'Got a Little Home to Go To' is his first CD and his first release on a commercial label. The CD combines live recordings of Bob's band at Ozark square dances with solo tracks of Bob and his long-time guitar accompanist Alvie Dooms, along with two duets with banjo player Bill Conley. The performances are top-notch and are among the best recorded examples of Bob's playing, both with the square dance band and on his own. The recording and engineering of the CD is excellent, and for the most part the instruments are very well balanced; if you're going to record live square dance music, this is certainly the way to do it - according to the liner notes, by plugging straight into Bob's amplifier. The exceptionally solid State of the Ozarks stringband includes, besides Bob, guitarist Alvie Dooms, Jim Beeler on rhythm banjo and lead electric guitar, Patty Beeler on bass, and Ted Heavner (who also acts as the band's MC) on second guitar. Alvie Dooms and Jim Beeler are the oldest members of the band, which has had a varied lineup in recent years. 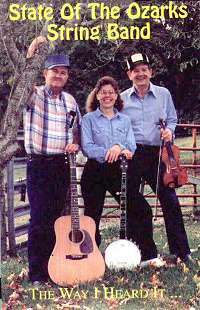 Harley and Betty Newberry, early members and also veterans of a country band in which Bob played in the 1950s, were absent from the square dance lineup for several years, but have since returned to replace Patty and Ted. This lineup - Bob, Harley, Betty, Alvie, and Jim - can be heard on their self-produced cassette 'Rabbit in the Pea Patch'. The CD also features Gordon McCann on second guitar - who although not a member of the band, has played with Bob and company for many years and co-produced the album - and Jim Nelson, who plays second guitar on Red Hills Polka. Among the non-band tracks on the CD are two of Bob and banjo-player Bill Conley, both of which - particularly Going Across the Sea - are gems. 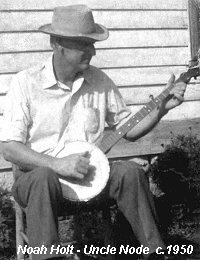 Given Bob's love of the combination of fiddle and drop-thumb banjo (one of Bob's major musical influences was a banjo player, his uncle Noah), it's a pity there aren't more tracks which include Bill's sweet, subtle, old-style playing. (More of Bob and Bill is promised, however, on a forthcoming Rounder release, 'Traditional Fiddle Music of the Ozarks'). Bob knows a number of old and unusual local tunes, a few of which are included on the CD. One of these - indeed, one of the most notable inclusions on the CD - is the title track, Got a Little Home to Go To (second setting), which has an archaic, modal melody relatively uncommon in the Ozark fiddle repertoire. Otherwise, the majority of the tunes included on the CD are 'breakdowns', with a few waltzes, blues, rags, and a polka and a two-step thrown in for good measure. Among these are many items that are with good reason among Bob's best-loved and most-requested tunes: Carroll County Blues, Wolves A-Howling, The Ninth of January (Bob's reworking of a certain well-known tune), Fort Smith, John Brown's Dream, Sugar in the Coffee-O, and many more - 25 tracks in all (only scratching the surface of the man's repertoire). The CD's accompanying booklet is excellent and consists of many pages of narrative by Bob about his life, background, musical activities, and so on, as well as commentary on each of the tunes. Bob is an articulate, thoughtful, and knowledgeable commentator, facts that make the booklet (which also features a number of excellent photos) a pleasure to read. Producer Mark Wilson also contributes an informative afterward. In his notes, Wilson declares his intention to "capture the ambience of a live square dance on record." But somehow the juxtaposition of live square dance recordings (complete with announcer's comments) with tracks featuring only fiddle and guitar or banjo (Bob announcing the tune titles at the start of each one) makes for a slightly disorienting listening experience - at least to my ear. Although theoretically I can't find fault with the idea, since square dances are where Bob does most of his playing, in practice I find it difficult to adjust between the two contrasting contexts, the one public and large-scale, the other intimate and small-scale. One wonders whether it wouldn't have been better to have given us Bob primarily in the more intimate musical settings, perhaps including three or four tracks of the square dances to round out the perspective - or, alternatively, to have made two separate albums. I must hasten to add, however, that not everyone may be bothered by this combination of formats. I recommend Got a Little Home to Go To to anyone interested in old-time fiddling and dance music, especially that of the Ozarks. Despite of my carpings about production decisions, this CD includes too much great music to pass by and should, if there is justice in the world, give Bob and his fellow musicians the wider recognition they deserve - and perhaps even ensure a follow-up album in the not-too-distant future. * Rabbit in the Pea Patch - featuring Bob and his square dance band (see above for personnel); and The Way I Heard It - with Bob Holt, Alvie Dooms, and Karen Kraft on five-string banjo. Both are available from Bob Holt at: HCR 71, Box 318, Ava, Missouri 65608, USA. Tel: (417) 683 2371. Brief reviews follow below. These two locally produced cassettes were made to satisfy the urgent requests of local dancers for recordings of Bob's square dance music - the first in 1993 and the second in 1997. Slight confusion may be caused by Bob's use of the same name for both his regular dance band (heard on Rabbit in the Pea Patch) and for the concert trio (on The Way I Heard It ... ). The former comprising: Bob Holt, fiddle; Alvie Dooms and Harley Newberry, guitars; Betty Newberry, bass; Jim Beeler, banjo ... the latter, of himself, Alvie Dooms, and banjo-player Karen Kraft. As I'm not a square-dancer myself, I have to admit to liking the second cassette better. Inevitably, a recording of a concert band more is likely to bear repeated listening than that of a dance band - it has, after all, been made for that purpose. This is not to denigrate the Pea Patch tape in any way - but the fewer instruments in the second tape do allow you to hear what's going on more clearly ... and what's going on is some very nice music (sound clip - Bull at the Wagon). In her excellent article on Holt, Julie Heningan mentiones that Bob plays faster than his father's generation of Ozarks fiddlers - and both he and Alvie advance reasons for why this may be the case. Certainly, Bob can play at a fierce pace when he needs to, though without loosing the music on the way - and this is reflected to some extent on the dance band tape. Knowing my preferrence for slow tempi, you'll not be surprised that this another reason for my liking of the second one more. The concert band is altogether more relaxed in its approach and I feel that the delightful and unusual local tunes benefit from this - try The Old Stillhouse (sound clip), which Bob learned "from my Dad's whistling and my Uncle Node's drop thumb banjo playing. They got it from the Deckard and Potter families living near-by. I've never heard it played anywhere else". The majority of the tunes on The Way I heard It ... are local - or, at least, local versions which Bob learned by ear from players he encountered in his youth. "This is mostly a collection of tunes indigenous to the southern Missouri Ozarks that I heard from a variety of sources when I was growing up in the '30s and '40s. Although these may not be exactly the way the tunes were originally played - this is the way I heard them. Many fiddles can learn a tune from the same source, but they will all hear the tune somewhat differently". Melodeon players, too! But not all the 25 tunes are rare ones, and even I recognised a few standards like Redwing, Midnight on the Water, Black Mountain Rag and this Doc Roberts classic, New Money (sound clip). Checking out the liner notes to Rabbit in the Pea Patch, it seems that the majority of those tunes are also local in origin, and rarely heard these days - so for Old-Time music fans these two tapes comprise a huge source of unusual tunes - another very good reason to contact to Bob at the above address and buy them in large numbers.